I am fearful that my timing in posting this may be construed as disrespectful or somehow insensitive, and yet it is prompted by my own feeling of helplessness in supporting Christchurch and Canterbury in this horrific time. This is in many ways my own tribute to your plight. I am not near enough to bake, or open my home, but I can stop and ensure I don't take my access to supermarkets, power, water and shelter for granted, and be prepared myself, for something that none of us ever want to go through. Kia kaha and aroha nui. We had a long power cut at home after a massive storm some years back, prompting us to actually do something about an emergency kit. We got as far as buying a bin to put everything in, getting 5 litres of water, a first aid kit and putting in a bundle of supplies I need (on account of having Cauda Equina Syndrome (CES)). Since then, we've frequently talked about getting some actual food and such like in there, along with a radio, torch, batteries etc. Well, until today, the kit had got to the point of being full of bottles of Simon's home brew. The first aid kit was somewhere in the store room, along with my supplies, and the container full of water had expired (seriously? apparently anyway). Oddly enough, current events have meant that we're thinking a lot about emergency situations and being isolated, without water, or access to supermarkets. So we've finally made significant improvements to our emergency kit, and I'd like to challenge others to do the same. If you, like us have been putting it off, at least begin to asssemble an emergency kit and plan. As we support Canterbury in this unimaginably difficult time (I have agonised over words for the last hour, unimaginable is all I am left with), let us also take a moment and be prepared ourselves. We've made a point of predominantly getting things that don't require additional water, and that don't require heating if we don't have the ability to do so. Oh, and in sizes that we will eat in a single sitting so that there a no scraps left sitting around, in anticipation of not having refrigeration. We've also tried to accommodate the possible need to take the emergency kit and ourselves away from home. and possibly some other things, which I'll update here once I've had more of a think about it - there are probably some glaringly obvious things missing, but as Simon emphasised, lets just get it started and have at least the bare essentials. We still need to work out a plan - ie what if we're at work, or one at home & one elsewhere, what if we have to leave home, with or without a vehicle, how will we make sure our families are ok, what about the cats etc. At least right now, if we were isolated for 3 days, we're significantly better prepared than we were yesterday (although some might argue a kit full of home brew might not be such a bad thing!). With gooseberry to the nose, this pale yellow coloured wine is packed with citrus and gooseberry intensity with a nice length. It is a nicely rounded wine at this age and a pleasure to drink. I wouldn't however recommend keeping it any longer and really shouldn't be keep Sauv's this long. We had a magnificent evening out at Te Whau Vineyard Restaurant last night. Located in a setting with majestic views looking back to Auckland and over Waiheke, the décor of the restaurant itself is clean and functional but it feels a bit lacking in terms of quality. The crockery, cutlery and glasses however were of a high calibre. For entrée, I had a lovely Seared & Spice encrusted tuna and Jane had an exquisite Paddle Crab salad on a Wasabi Mousse. The Lamb Loin was very flavoursome with a strong pistachio and olive sauce. The Beef Eye fillet was also ridiculously tender and beautifully cooked. To accompany my main course I had a Te Whau 2007 “The Point” Bordeaux blend and it was magnificent. For dessert we shared a Chocolate.Truffle Tart with a Coffee Panacotta and Fresh berries, and a Washed rind cheese. Both were excellent, however the chocolate tart dessert was as Jane described “Perfect”; all components contributed to a beautiful balance. It’s not a cheap evening out but the meals are superbly executed, service excellent and a magnificent vista. Thoroughly recommended. We spent a lovely day at Waiheke on Saturday. This island has so much to offer that there was no shortage of things to do and we ended up doing quite a bit. After an excellent breakfast at our accommodation we set off to explore the Sculpture trail. This is a free outdoor exhibition that runs for a couple of months around the headland of Waiheke with magnificent views to be seen along the walk. There was also a nice touch of sun umbrellas along the walk you could pick up and make use of and drop off at another location. After the sculpture walk we headed to the middle of the island and sampled some lovely Olive Oil at Azzuro Groves (where we purchased a Greek Olive oil) and then had some excellent Herb Spread from Rangihoua Estate. We then continued across the island (it’s a lot bigger than you think!) to Passage Rock for a magnificent lunch. See previous blog post for further details. We then went in search of a couple of geocaches on the far eastern side of the island and found one of them, but more importantly got to see some of the island’s beautiful scenery and go to parts of island we have never ventured to before. The fort at Stony Batter was our next stop where I did a self-guided tour through the tunnels (pitch black without a torch) and emerged via a ladder at one of the gun turrets. There is an $8 entry fee to the tunnels and you can hire a torch for $5. Thoroughly recommended, although getting out of the ladder at the end won’t be for everybody so you can opt to return via the tunnel. For dinner we had a lovely meal at the Te Whau vineyard restaurant. Another blog post will detail this. 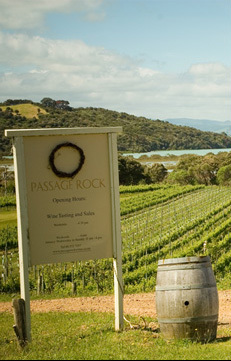 In addition to having some superb wines (the Reds and Reserve Syrah in particular), we had an excellent lunch at the Passage Rock Wines cafe today on Waiheke Island. We arrived without a booking, but the staff were very accommodating and setup a table for us inside (unfortunately none were available out). The restaurant was busy and there was a good vibe of activity, contributed to by the relaxed but efficient and professional staff. We ordered a pizza and Salmon Nicoise Salad to share. Both were nicely presented, packed with flavour and arrived in a very timely manner. The high quality of the ingredients used was evident and the food tasted like it was prepared with care. The wood-fired pizza base was very thin but still a nice firmness and a delight to eat. We will very happily return. Donna Hay the Miracle Maker - Brussels Sprouts were YUMMY! We are a household that categorically does not like brussels sprouts. Both on principle, and on taste. However occasionally we meet a brussels sprout (tried to shorten it to BS but realised that was just a little inappropriate!) that we actually enjoy. Tonight was one of those occasions and all credit is due to my favourite recipe author - Donna Hay. Her December/January magazine has a host of divine looking trifle recipes that I'm itching to try, along with the Red Velvet Layer cake, but tonight it was Brussels Sprouts. (I expect you're asking why we actually buy them if we don't like them. I'm not sure really. Call me an optimist. And we try to eat a variety of veges to keep things interesting). The recipe is on page 148 and is appropriately titled "Brussels sprouts with lemon, garlic and almonds". Seriously - if you're not a sprouts fan, give this one a go, they are really really really yummy and I will be intentionally buying them again to make this recipe. Oh, and as a bonus, the recipe instructions are a mere 4 lines long. With a magnificent light leather nose, this brick brown coloured wine is very smooth, however it is lacking in any form of complexity, length or weight. I'm feeling it may have been better a few years ago.